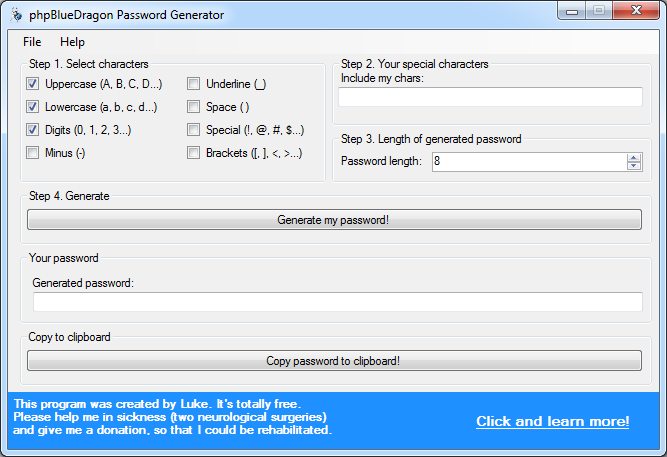 The tool helping in generating of the difficult, random password from among signs chosen by the user. User can choose groups of capital letters, lower-case letters, figures, the sign of the minus, the underscore character, the space, the special character and parentheses. If you have your own signs, you can it boldly also augment the program. You choose the password length. After finished configuration and the click button Generate password! it is ready to copying from the field Generate password. This program permits to avoid entering exactly the same password to many pages and programs, across what the break of one password provides access to many services.